When it comes to backpacking pots, you’ve got lots of options available. Not only are there different designs, but pots can be made of different materials. Below we’ve got the information you need to better understand your options. Aluminum is a common material used to make pots. In fact, it used to be the first choice of backpackers because cookware made of this material is lightweight and inexpensive. Aluminum also heats very quickly. However, aluminum has lost favor due to health concerns related to the metal leaching into foods. Aluminum also has a tendency to not be extremely durable and food often sticks to it, making cleaning more difficult. You can get non-stick aluminum, however the non-stick surface can be damaged easily. Personally, we don’t prefer aluminum. Stainless steel is another material used. Some of its advantages include being durable, easier to clean and reasonably priced. The disadvantages of stainless steel are that it is the heaviest of the options and it tends to burn food because it doesn’t distribute heat easily. One way to combat this is to look for stainless steel cookware that has an aluminum lining in the base of the pot or to stir food constantly. Also, with the invent of lightweight stainless steel, which has all the advantages of stainless steel, it is easier to find stainless steel gear that isn’t too heavy. We currently use stainless steel and just deal with the extra weight because of the price. Titanium is the final material cookware is made from that we’ll discuss. Titanium is great because it’s easy to clean, durable and extremely lightweight – often less than half the weight of its stainless steel counterparts. While it does not distribute heat as well as aluminum, when compared to stainless steel, it does a much better job. Titanium does heat fast and thus can burn food quickly if not watched. The main disadvantage is that titanium cookware is the most expensive of your options, as titanium is a harder metal to produce. If you’re looking into titanium, expect to pay double or more than you would for a stainless steel set. How Many Pots Do You Need and What Size? Basically, you should plan on needing 16 ounces of pot space per backpacker. This can translate into a single 2 liter pot for four people or two 1 liter pots for four people. Unless you’re camping with a large group or wanting to make complex meals, you should rarely need more than one pot. And remember, one pot can do a lot. It can make your coffee, fry your eggs and cook your pasta. Look at backpacking pots come with lids. Lids make heating more efficient and conserve your fuel. 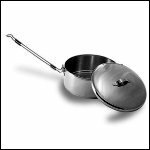 Look for a lid design that can also double as a frying pan and/or plate. Make sure your cookware has a detachable or foldable handle for easier packing. Most designs are made this way, so it’s not hard to find. If you want more than one pot, get a cookset that can nest for easier packing. For more information on these, visit our backpacking cookset page. Don’t forget to use your pot as storage space for utensils, stove, fuel or dishes. Buy quality! Don’t try to get away with buying cheaper backpacking cookware that is low quality to save money. You will regret it!